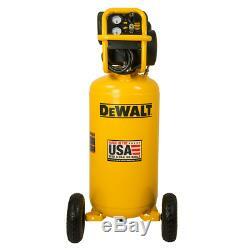 Dewalt 1.7-HP 27-Gallon Portable Air Compressor (120V 1-Phase). 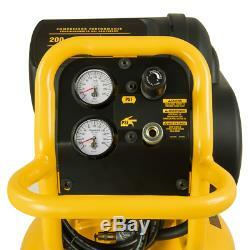 Dependable Electric Portable Air Compressor. 78dBA is ideal for indoor use where noise is an issue. 30% more quiet than similar oil free induction products. Perfect for larger projects, spray painting, HVLP spray gun, blow guns, brad and nail guns. No need for oil separators in your airline system. Provides cleaner air for tool operation and less maintenance. Fast recovery time results in increased project efficiency. Provides more usable air resulting in longer tool run times. 3X more tool run time compared to typical 26-gallon oil-free compressors with direct drive induction motors. Heavy Duty 1.7-HP Induction Motor. Designed for maximum performance and efficiency. Oil-free offers a maintenance free and peak tool performance. Compliant with UL and CSA standards. Motor will operate on up to 400 ft.
Of extension cord (Properly Sized). Works in a variety of temperatures. Compact design for easy portability to job sites. Tackle airbrushing, drilling, sanding and bolting/wrenching. High Flow Regulator & Couplers. Offers peak performance for tools with maximum airflow. Engineered for high performance and durability. Dual gauges to monitor tool & tank pressure at a glance. Easy to move around garage or workshop. Great for uneven terrains & dampens vibration. Power Equipment Direct was founded on the premise of simplified shopping. Customers could sort through all of the leading power equipment products online from the comfort of their homes - no traffic jams, no crowds, no scratched tailgates. Founder Jon Hoch, launched his first web store from his basement in 2003. Several years and a couple of web stores later, Power Equipment Direct is one of the leading online power equipment e-tailers with millions of dollars in annual sales. The company owns more than a dozen power equipment-related web addresses and plans to open more specialty superstores in the very near future. Exceptions include some handheld lawn tools. Boxes or APO/FPO addresses at this time. Each item which this applies to, will contain information in the respective listing description information. Thank you for your time and understanding regarding this topic. In some rare instances, you may need some help with a return. Simply contact our Customer Service team in order to discuss return options for unopened merchandise. Simply contact our Customer Service team in order to discuss return options for opened merchandise. If the product has been gassed or oiled, it needs to be taken to an authorized service center. Concealed damage claims must be reported immediately. On occasion, the outer carton may look damaged, but the product inside the box is perfectly fine. Do not sign for damaged products. If you think your product is defective, don't worry. They have expert technicians standing by to help solve your issue. Please have your model number and serial number available for fastest service. And we will respond within 24-48 hours. The item "Dewalt 1.7-HP 27-Gallon Portable Air Compressor (120V 1-Phase)" is in sale since Wednesday, April 4, 2018. This item is in the category "Home & Garden\Tools & Workshop Equipment\Air Tools\Parts & Accessories". The seller is "powerequipmentdirect" and is located in Bolingbrook, Illinois. This item can be shipped to United States.